This weekend Droughtlander ends! 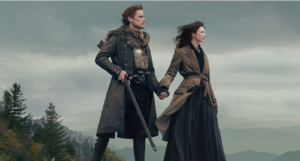 Season 4 of Outlander premieres this Sunday, November, 4th at 8pm (EST) Get your kilts and whisky ready! 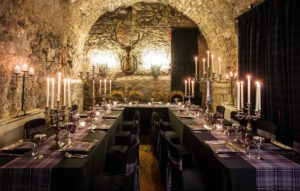 The brand new wedding offering, which launched on 1 June, includes a stunning, candle-lit ceremony in the Castle’s historic Auld Keep, a Scottish piper to add to the atmosphere, and a medieval banquet. However, the ‘jewel in the crown’ of the special package, is a beautiful replica of Claire’s ring as described in the book, designed and crafted by Scottish jeweller Hamilton and Young, and will be gifted to every bride who books an Outlander Wedding. Couples will also be offered an appointment with local supplier, ScotlandShop, who can tailor some tartan for their special day. Dundas Castle is perfectly situated just 15 minutes from Edinburgh Airport, and 25 minutes from the centre of Edinburgh, yet nestled within its own 400 acres of secluded estate. The Castle, still the home of owner, Sir Jack Stewart Clark and his wife, Lady Lydia, is available on an exclusive use basis. It is an idyllic hideaway for a romantic wedding, with an expert wedding planner, which ensures every couple has the perfect day. From a genuinely welcoming smile on arrival, the focus is on luxury, comfort and a true five star experience. As well as the Auld Keep, the elegant house provides a home from home, with chandeliers, roaring fires, comfortable sofas and a stunning staircase, offering flexibility and luxury throughout. Each bedroom has been individually styled by owner Lady Lydia; resulting in style, comfort and luxury throughout, complete with luxury bedding, L’Occitane toiletries and complimentary whisky.